Kiran Kumar says the era of just the government doing space business is over and that industry partnerships are necessary to handle competition. New Delhi: India needs to first get the world to realise that it can deliver on its space potential before it can collaborate on global space projects, said Indian Space Research Organisation (ISRO) chief A.S. Kiran Kumar. A joint lunar mission with Japan is on the cards, but is currently just at an initial stage, and clear objectives of the mission have not been decided yet, the eminent space scientist said at ThePrint’s ‘Off The Cuff’ on Monday. Kumar also said that plans for Chandrayaan-II seem on track and the ISRO is looking to launch it in the first half of 2018. 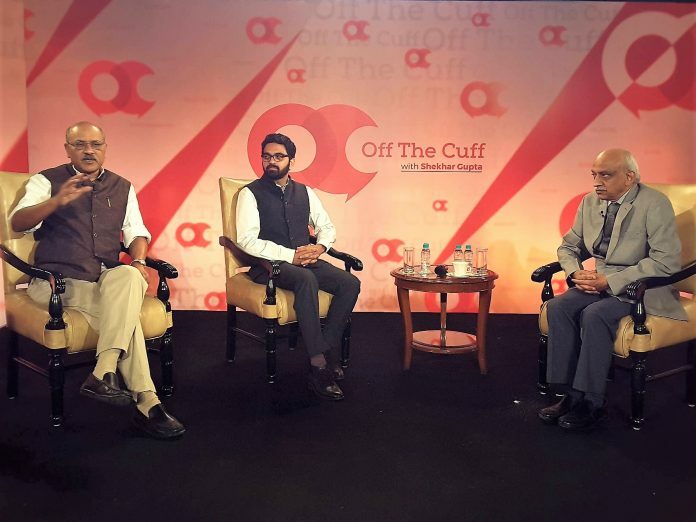 Kumar, who was in conversation with ThePrint Editor-in-Chief Shekhar Gupta and Deputy Editor Manu Pubby, said that ISRO being a government body has to work with limited resources and manpower, and thus has to rely on industry and academia to be able to compete with the rest of the world. However, he stressed that the era of just the government working in the space sector is over. The market is highly competitive, and must be capitalised on with industry partnerships, he remarked. Speaking about collaborative efforts in space programmes, Kumar, however, indicated that the probability of a startup like TeamIndus launching a satellite is on a lower side. “But things could change,” he said. TeamIndus is one of 5 companies selected for Google’s Lunar XPrize competition, and has to launch its moon rover by March 2018. But it has been struggling to raise funds to meet tech deadlines and is estimated to be about $23 million short. Asked how India is tackling competition in the space business with countries such as China offering cheaper services, Kumar said that India is still very much engrossed in “bringing our capability to a certain level”. “In terms of the resources that are being made available, you cannot compare what is happening in China with what is happening in India. If you put together all the money we have spent right since our inception, it will probably be less than a fraction of what these countries spend in a year,” he explained. He, however, ruled out the apprehension of government’s interference in ISRO affairs because “space technology is a niche field”. “The government gave a lot of freedom to the organisation to concentrate on its work and deliver,” he said, adding that ISRO is focused on meeting the country’s observation, communication, and navigation requirements. “The primary objective of ISRO’s activities is to address specific issues. For that, we have 42 satellites in operation. The need for the country is to double that number,” Kumar said, adding that this can be done by increasing the number of launches and making them cost effective.